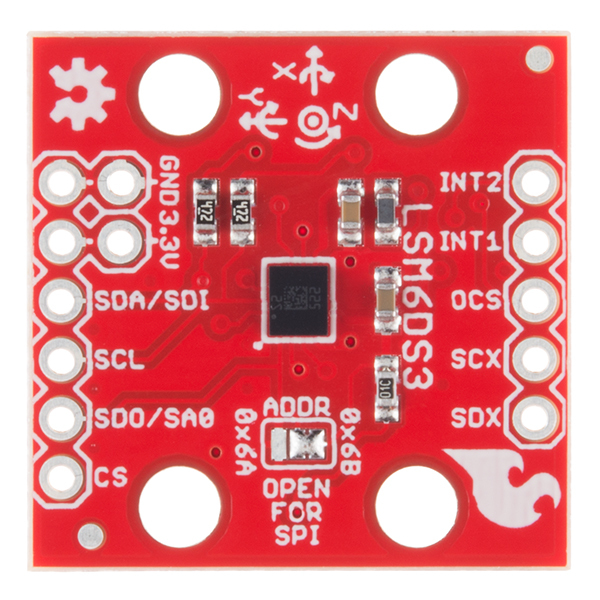 The LSM6DS3 is a accelerometer and gyroscope sensor with a giant 8kb FIFO buffer and embedded processing interrupt functions, specifically targeted at the cellphone market. 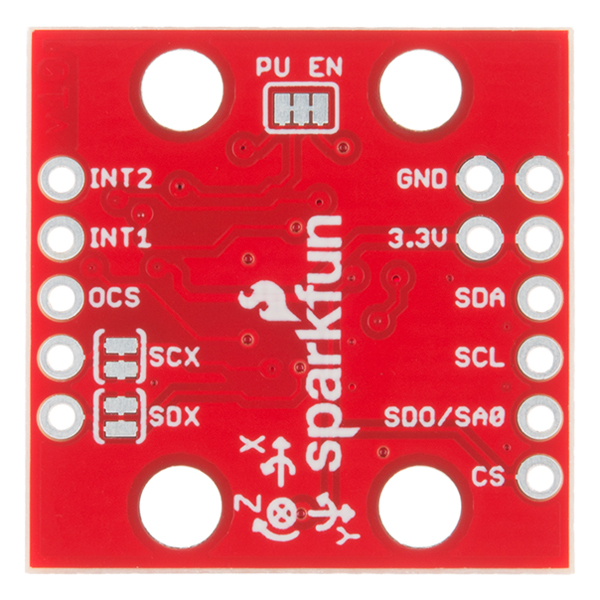 Due to the capabilities and low cost of the LSM6DS3 we've created this small breakout board just for you! Each LSM6DS3 Breakout has been designed to be super-flexible and can be configured specifically for many applications. With the LSM6DS3 Breakout you will be able to detect shocks, tilt, motion, taps, count steps, and even read the temperature! 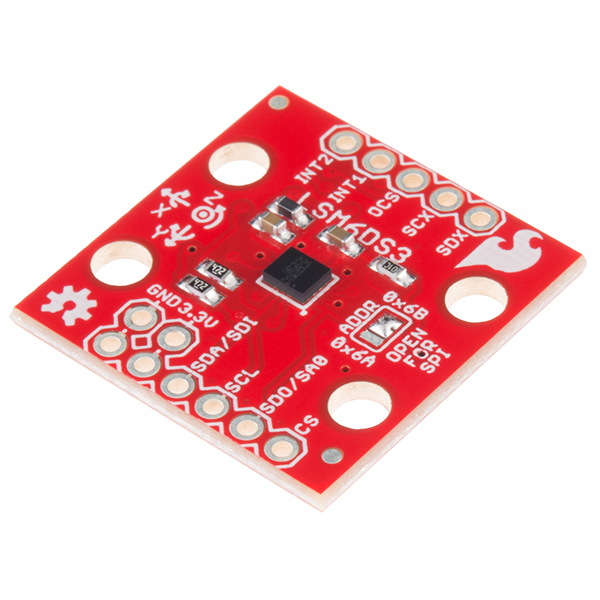 The LSM6DS3 is capable of reading accelerometer data up to 6.7kS/s and gyroscope data up to 1.7kS/s for more accurate movement sensing. As stated before this breakout also has the ability to buffer up to 8kB of data between reads, host other sensors, and drive interrupt pins all thanks to the LSM6DS3's built-in FIFO. What is the part number / specs for the inductor shown in the schematic ('L2', RES-07859)? Building my own PCB that includes the LSM6DS3 circuitry and can't find the values for the inductor anywhere, and 'RES-07859' doesn't come up in any search..
Hi! RES-07859 is one of our internal part numbers so it won't show up anywhere online. This inductor is a 30 ohm ferrite bead and is similar to part number MPZ1608D300BTA00. Hope that helps! 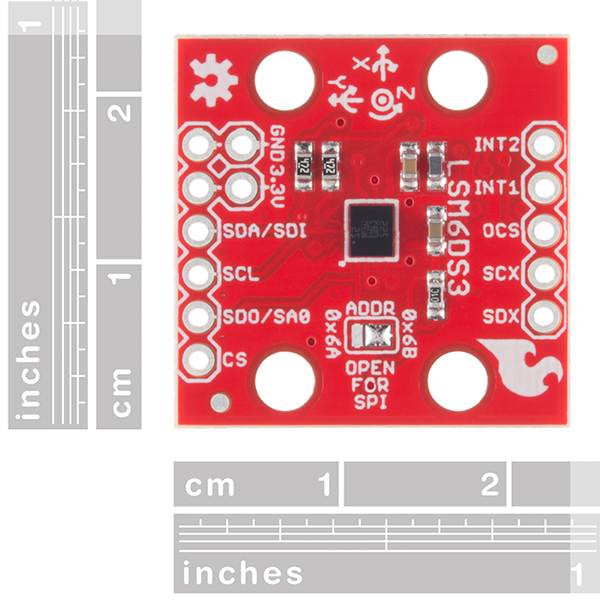 I chose the LSM6DS3 becayse I needed a 6DOF IMU that was ready to hookup to a microcontroller. Also, it had great reviews and a hookup guide. The only downside is that it required a little soldering to add pins. That was only a downside for my uses. Otherwise it is still useful have the option to solder wire directly to the throughhole! I highly recommend.